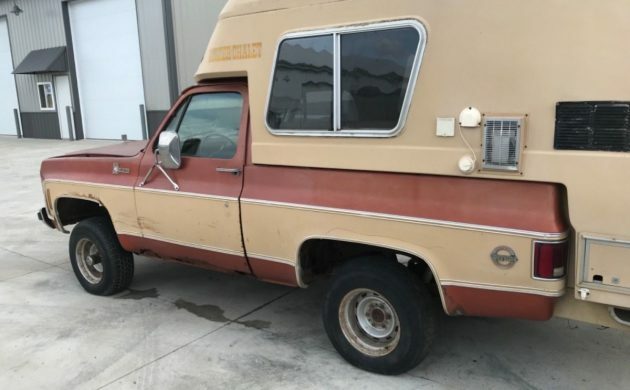 While this at first may appear to be like any other pickup with a camper attachment in the bed, this Chevy K5 Blazer is actually a one-of-about 1,900-made “Chalet” edition. It features an open bed design with a pass-through from the cabin directly into the camper portion, and this example also has a mostly-straight body to go along with the slightly tatty camper attachment. Find it here on eBay with a $3,500 Buy-It-Now and the option to submit an offer. Pictures of the camper attachment are minimal, which is too bad since that’s the most intriguing aspect of the Chalet package. The camper actually features a pop-up style roof, in addition to a stove and a fridge – but no toilet. So while there are plenty of creature comforts in this camper conversion, stopping for public restroom facilities is still a necessity. Would you consider a Blazer with a camper body attached? Is $3,500 a fair price or would you submit an offer? Hmm, I’m surprised this one hasn’t been rolled,,,yet. My old man bought one of these, yep, it was rolled. Extremely top heavy, and with 4 wheel drive, people took these where they really shouldn’t have. 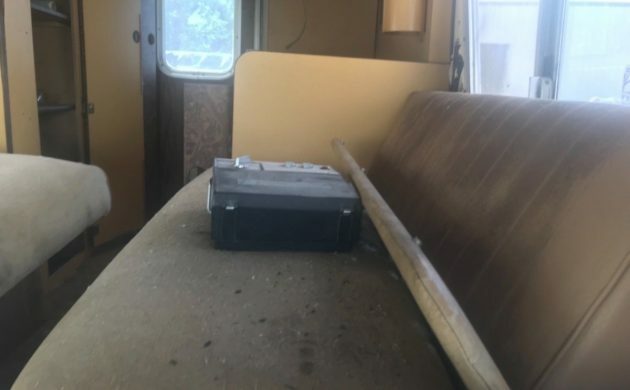 The camper portion of the old mans was too far damaged for repair, so he removed and gutted the camper, and tried to sell the Blazer as a Blazer,,,no dice. When the company mounted the camper, they cut the rear header to open for the walk thru, and the stock Blazer top won’t fit. Great concept, but better carry a couple of gas cards as you max each one out on your travels, and don’t go too far off road. Not sure if it’s me, but it seems like this rig gets passed around quite a bit. It’s just you, I believe. 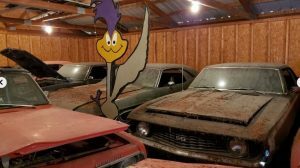 I’m the guy who tries to track all of these that are still in existence, I’m also the current caretaker of the old blazerchalet.com web site. I have a mega-spreadsheet on these where I can more or less identify around 500 of the 1,780 produced, either with photos or specific details from old sales ads, and this particular one is one I haven’t seen. 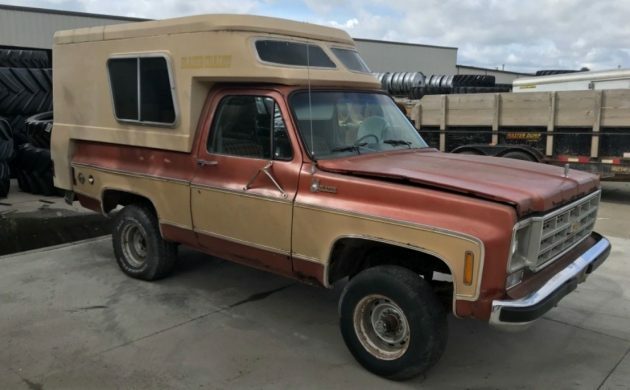 There is another bronze and tan one being repeatedly relisted in the Oregon area, not the same rig, and there have been others in this bronze/tan 1977 model year color combo recently listed. 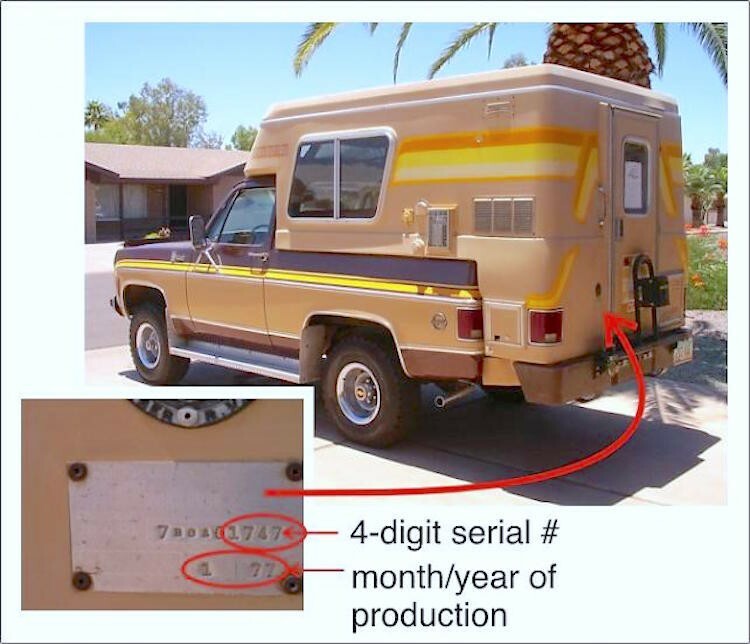 The ebay seller of this one says he will be adding a photo of the serial number plate to his listing, it’s how we ID these. Pic below of my former Chalet #1747 and its serial # plate. 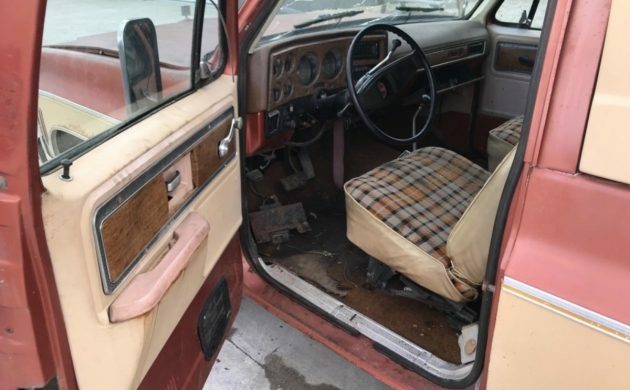 My apologies, allow me to correct myself: I have seen this one before, in a set of rather lousy photos in a 7/4/18 Des Moines Iowa Craigslist where the asking price was $2100. 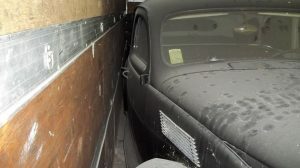 Didn’t catch it at first, but this ebay listing shows the same incorrectly black-painted refrigerator outside grille toward the back of the driver’s side, which is the main identifier of this one. 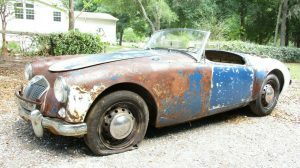 Rust spots and other details match the Des Moines Craigslist ad. 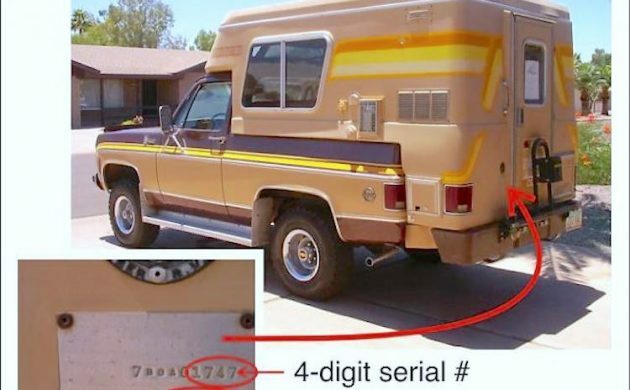 IMHO, that ID plate needs to be located…even RE-located to the interior, somewhere, to keep it from rusting…any more. Just my thoughts. Thanks Russell for being the caretaker. It just seemed that they are here some what often. I think they are nice, used within reason they could be a perfect rig. Looks like someone left there baseball mit on the fender when they closed the hood. If a good runner $35 is a deal. Take care, Mike. 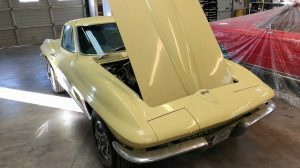 Many early chevy hoods bent like that because the designed in creases fold at that point. Mike (leiniedude) – Thanks for those refs. I actually already knew of them, I replied to the first twin listing post somewhat far down in the comments there. Chalet #0480 for the first one (where the seller incorrectly listed it repeatedly on eBay as #0007) and the Casa Grande was #1675, which subsequently ended up at this shop https://www.instagram.com/p/BkYzqozgOxt/ . The second listing for the one with the replacement front fender is Chalet #0142 which was repeatedly relisted on Craigslist in Boise before it popped up for sale again in Dallas a year after. And the last post of the incorrectly painted de-striped bronze/tan one is Chalet #1131, last seen after its eBay sale being transported to Las Vegas https://plus.google.com/+GraemanLLC/posts/4yKx9Jaj67k . Still haven’t found out what the serial number is for the Chalet in this current post. Call it a hobby, I look for these on a near daily basis, but I never turn down tips about them since my bookmarks for nationwide Craigslist ads never seem to catch more than 2/3rds of them. I hadn’t bookmarked BarnFinds until lately, my bad when it comes to missing out on seeing so many other spiffy old rides. Yes, & very desirable by many (but not this ford guy). every vehicle is made to a specific application (hopefully even custom/DIY ones) and as such need to B judiciously applied to that application. Automobiles R a system w/ components which changed – effect all other prts of the system. Multipurpose vehicles even more difficult to mod, ‘apply’, drive, etc. Ive never thought of a camper for these older Blazers but it makes perfect sense. I had a 75 where the whole top would come off and the windows had no frame when open. I imagine they would be a better candidate but I wonder if that would tax the sturdiness with something like this added. Take another look at those seats (plural). That’s not a bench in front. As a 10 year old, I remember looking at one of these at Chuck Olsen Chevrolet in Seattle with my grandparents. They wound up not buying it because my grandma struggled a little to get up into the back of it – they wound up buying a Chinook RV on a Dodge chassis. I thought it was really neat – still do. When I was in high school, mid eighties sf bay area, the ski club went on a weeklong trip to Squaw Valley. An upper-classman had one of these and chaperoned a group of us up and down the mountain. I recall coming down in a bit of a storm. Glad I made it.. this thing looks sooo sketchy! On the other hand, this could be perfect for the occasional weekend endurance racer. It’s tow vehicle and lodging in one! I have a question. Why buy something that doesn’t look like it fits and is too heavy? Why not buy a 3/4 or 1 ton and a decent camper? Because this is a rare special edition truck. I’ve had several blazers over the years,but I’ve never seen or heard of these. I learn something new every day. I remember seeing one of these new at Jim Ryan Chevrolet in Minot , ND. Still remember where is was displayed. My dad was in the market for a pop up camper so he stopped and looked. Again if memory serves me correctly, I think sticker was 13k. He thought that was extremely high. Wish I could buy this I had one about 20 yrs ago loved it.